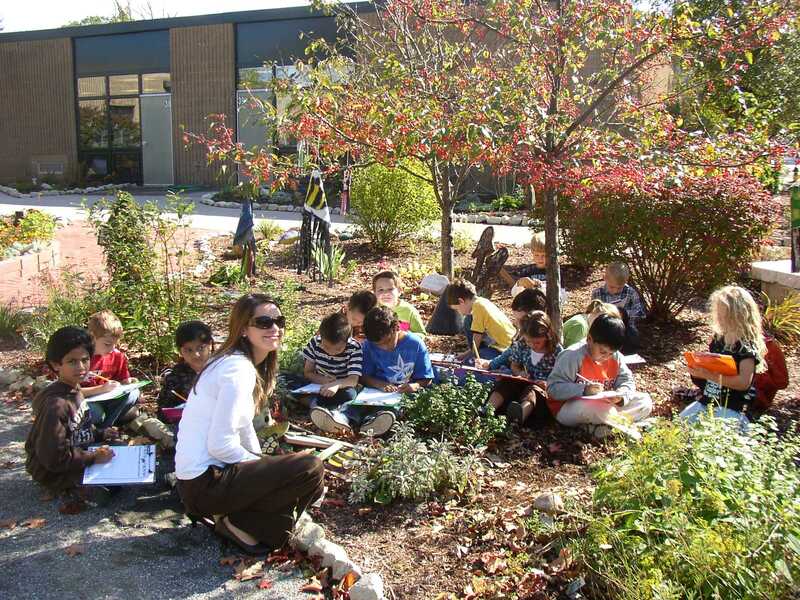 For many years, New Hampshire Project Learning Tree has worked closely with Bicentennial Elementary School, a school of about 670 K-5 students in Nashua, NH, to embed study of the environment into our curriculum at every grade level, provide sustained teacher professional development, and build stronger connections between the school and its surrounding community. PLT’s GreenSchools Investigations and environmental improvement service-learning projects have been incorporated into this “whole-school” work. Driven by the school’s Green Team, which is a volunteer student group comprised mostly of 5th graders, teams of students and teachers have investigated their school’s solid waste and recycling, water, and energy. These comments from 5th-graders on Bicentennial’s Green Team reflect why our efforts are both popular and successful. Just like adults, children have lots of reasons why they want to learn and take action about things they think are important. 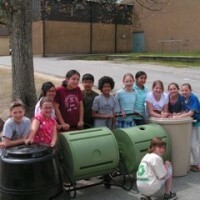 PLT GreenSchools helps us give them this opportunity. We incorporated environmental themes into science, language arts, math, art, and music. Among other achievements, our students’ science scores rose, and a focus on environmental education has had a positive impact on students, teachers, and the entire community. The energy audit prompted installation of “Hit the Switch” reminders on all light switches. The students also designed “Energy Vampire” and “Energy Angel” classroom stickers—reminding offenders that they are “sucking up energy” when they leave lights on unnecessarily or are helping when they turn lights off. The waste audit inspired a plastic and aluminum recycling program, a first for Nashua’s public schools. The program is student-run, and the students collect and sort recyclables. Second and third graders formed a “compost team” in concert with the cafeteria staff. The Green Team also wanted to continue to minimize waste by having an “It’s Easy Being Green Yard Sale” in the spring near Earth Day. Staff, parents, and community members benefit from this event! By cleaning out closets, we fill our entire cafeteria with donated items that are recycled back to our community. The Green Team also constructed a little golf course out of recycled materials for kids while their parents shopped. We sold compost bins, rain barrels, and aluminum water bottles at this event, as well as demonstrated how worms break down material in some compost bins. The Green Team picked herbs from our outdoor classroom, let them dry, and made scented bags to sell at the yard sale. When students realized the impact of purchasing bottled water, they created a “Back2Tap” campaign. The Green Team now sells re-fillable aluminum water bottles to students and staff. The water investigation also revealed that our school had 3-gallon flush toilets. Students quickly found out this was a waste of water and wanted to find a way to change to 1-gallon flush toilets. We applied for a grant from the National Environmental Education Foundation that helped us to install six low-flow toilets, a start toward our goal. Make connections: From an educational perspective, of course we need to connect to the curriculum. But it’s also important to motivate kids by connecting to the things they value. The comment above from a student about associating nature with her father is a great example. Let students lead: It is tempting for us to want to save time and tell students what they should do. Sometimes we need to sit back and let them figure it out for themselves (as long as they remain safe). They have more ownership and they have learned valuable lessons. Get buy-in: When we first decided to integrate environmental education throughout the school, the faculty took a vote—and it was very close. Since then, teachers have seen the benefits for themselves and their students, and the school leadership, up to and including the superintendent, has been very supportive. This is a great boost to what we are trying to accomplish at Bicentennial. Have a committed coordinator: A coordinator promotes teamwork and decision-making. This person shows leadership by coordinating the Green Team, encouraging a sense of shared responsibility, providing the team with information, and overseeing implementation of programs. Tanya Ackerman is a fifth-grade teacher at Bicentennial School in Nashua, New Hampshire, and is the facilitator of the school's Green Team. She was first introduced to PLT in 2008. A large, diverse Title 1 public school and a small, private school in Houston both use PLT’s GreenSchools program to meet the needs of students.